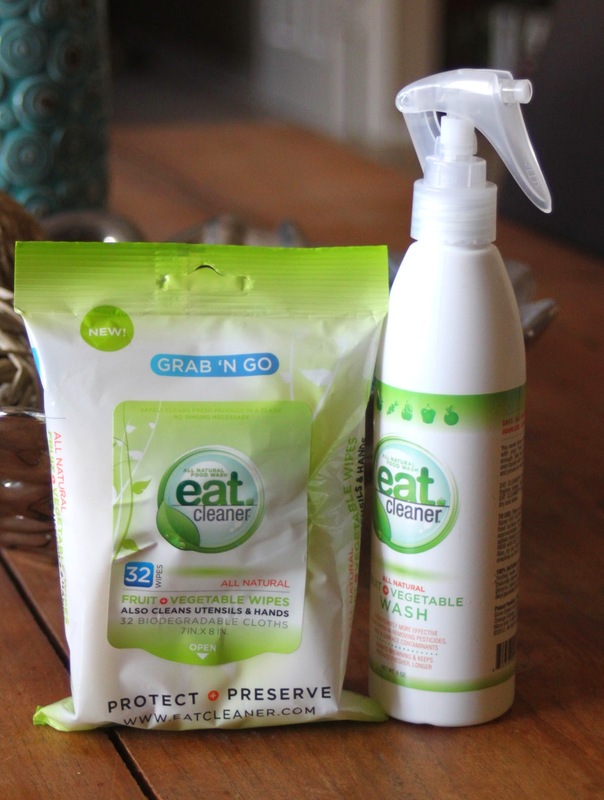 Healthy, Busy Mom: Healthy Product Review: Pesticide Free Produce with Eat Cleaner! I've decided to start doing some healthy product reviews. No, I'm not getting paid, but I do think it's important to share products that have the same healthy mentality as all the other Healthy, Busy Mom's out there. And, let's face it...sometimes being healthy and eating healthy is expensive. I can't even always afford things like organic produce, and then I feel awful about feeding my kiddo something that might be full of pesticides. It's a vicious cycle that never ends. It's upsetting to me that our food has changed so much over the years, and now the artificial junk is cheap, and the REAL food that everyone ate 50 years ago, is the premium stuff. It makes no sense. I'm so thrilled to share something with all of you today that has REALLY helped me feel better about the produce I'm feeding my family. Eat Cleaner is an awesome fruit and veggie wash that literally cleans ALL the pesticides from your produce! I'm not sure how I ever lived without this stuff. Eat Cleaner was developed by Mareya Ibrahim, (a healthy, busy mom) and her father! I just love that their mission is "to set the record straight on what’s on our plates and help everyone take matters into their own hands." So that's what I'm doing today. I LOVE the smaller travel wipes to use on smaller items (my sweet peppers). They're also GREAT on the go, for travel and restaurant stops. I noticed immediately that the outside texture of the veggies changed from a tough, waxy feel to a very smooth and softer feel. LOTS of produce is coated with a thin amount of wax to "seal" in freshness and block out germs and bacteria. But, just "rinsing" our veggies off before we eat them doesn't get rid of the wax (or anything else that's trapped in with it). Yuck. Eat Cleaner gets rid of all that! Some of the larger items like cucumbers and potatoes, which can have up to 35 pesticides on them, call for a little more than a wipe with a cloth. I sprayed them well with the wash, let them rest for about 2 minutes, then rinsed them clean. The cucumber had so much wax on it, I could almost PEEL it off! My potatoes thanked me as they got brighter, cleaner and happier! I didn't really notice a taste difference in anything, until I got to the celery. I couldn't believe the difference. I've avoided raw celery in the past, simply because I didn't really like the flavor. I usually give it a quick rinse, just to get the dirt off, but I didn't realize that the flavor I was avoiding were the pesticides and wax locked onto the celery. I'm also REALLY looking forward to having Eat Cleaner prolong the life of my fruits and veggies. One of the things that attracted me to this product was seeing the photos on their website. I can't tell you how many tiny $5 containers of blackberries I've thrown away because they got rotten and moldy almost overnight. A good spray with Eat Cleaner can help them to last for up to two weeks! FROZEN blackberries don't even last two weeks in my house! I've got some in the fridge right now...if they aren't eaten in a week...I'll let you know...don't hold your breath. Eat Cleaner is a new, welcome addition to our food, our family and our healthy, busy lifestyle. I'm definitely feeling a little safer today with my produce, and I certainly feel like I'm a little more in control of what I'm putting into my family's bodies.